Our Heritage Lottery Young Roots project, Projection SEAS, has finally come to an end. 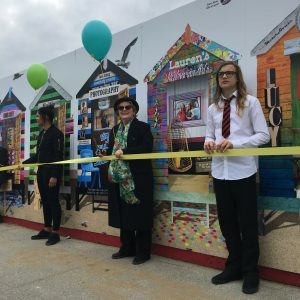 Our young participants achieved 12 Arts Awards, beautified Ramsgate seafront and drew attention to the fabulous South East Archive of Seaside Photography. If you haven’t yet got a copy of SEAS and Seeing, then come and see us at the Addington Street Fair on September 3rd. We’ve been talking to local young people about what they’d like to do and are now at work on our next big youth project. We will be working with the Ramsgate Society and the project will dovetail with Ramsgate’s Heritage Action Zone.